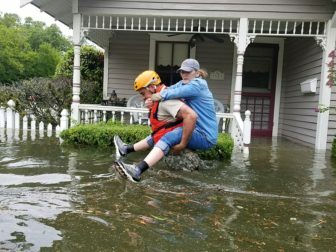 A Texas National Guard soldier carries a woman out of a flooded building during rescue operations in Houston. — This article by Colleen Tressler is a post on the Federal Trade Commission blog. Be alert for charities that seem to have sprung up overnight in connection with current events.Check out the charity with the Better Business Bureau’s (BBB) Wise Giving Alliance, Charity Navigator, Charity Watch, or GuideStar. Find out if the charity or fundraiser must be registered in your state by contacting the National Association of State Charity Officials. If they should be registered, but they’re not, consider donating through another charity. The American Red Cross accepts donations on its website. Also, you can text HARVEY to 90999 to donate $10. AmeriCares (an international charity based in Stamford) carries medicine and supplies to survivors. Donations to the Salvation Army can be made online, or by calling 1-800-SAL-ARMY (1-800-725-2769) or texting STORM to 51555. To help animals suffering from the disaster: the Houston Humane Society or the San Antonio Humane Society. The Texas Diaper Bank in San Antonio is asking for diapers and wipes, which can be mailed to 5415 Bandera Road, Suite 504, San Antonio, TX 78238. A concert in Norwalk to benefit victims of Hurricane Harvey, originally scheduled for Sept. 6, has been postponed to the following Wednesday, Sept.